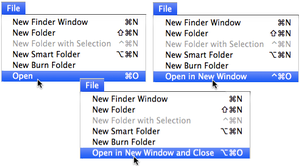 Think the Finder’s menu commands are simple and straightforward? Think again. Add to your desktop repertoire by using hidden menu (and keyboard) commands. All you need to make them appear is the right magic key: Shift, Option, or Control. The standard Open command changes to Open in New Window when you hold down the Control key, or to Open in New Window and Close with the Option key pressed. Want to open a folder? You’ve got options. Select a folder in a Finder window, open the File menu and press the Control key to change the Open command to Open in New Window. Not only do you get to keep the original window around for further work, but also the new window displays the folder’s contents the way you last left it—say, in a short-but-wide, Icon-view window in the lower right of the screen—instead of using the current window’s settings. If you prefer to use the keyboard, press Command as you double-click a folder to get the same effect. When you want to open a folder the way you left it, but don’t want to be stuck with two open windows, use the Option key to change the Open command to Open in New Window and Close. The original window will close as the new one opens. With a file selected, pressing the Option key changes the Open command to Open and Close Window. It sounds like a practical joke, but is merely practical, since it opens your document and closes its no-longer-needed window in the Finder. Another approach for this clean-as-you-go procedure is pressing Option when you double-click a folder or file. A document usually knows what app created it, so when you double-click the file, that app opens. But what if you don’t have the parent application, or if the default program is one you’d rather not use? A JPEG image, for instance, can be opened by Apple’s Preview, Adobe Photoshop, or any Web browser. A text file might open in Microsoft Word, Apple’s TextEdit, or Bare Bones Software’s BBEdit. You can override the default by using the File > Open With command and choosing from the submenu. Or, Control-click (or right-click) on a file, and choose the Open With command in the contextual menu that pops up. To make the program you choose the new default when you open a particular document, press Option to change the contextual menu’s Open With command to Always Open With. Forever afterward, that document will open in the app you chose from the contextual menu. Bonus tip: Want to always open a certain type of file in a specific program? You might want, for instance, JPEGs to always open in Photoshop so you can edit them, instead of in Preview. Select any JPEG and choose File > Get Info. In the Info window’s Open With section, select an app from the drop-down menu, click the Change All button, and click Continue in the confirmation dialog box. You use File > Get Info on Finder items, right? It opens the Info window for the selected item, which provides all sorts of…well, info. You’ll find the basics of kind, size, and created and modified dates, and you can change things like the item’s icon or label color. But press Control, and the menu command changes to Get Summary Info. Press Option, and you get Show Inspector (or Hide Inspector if it’s showing). What’s the difference? 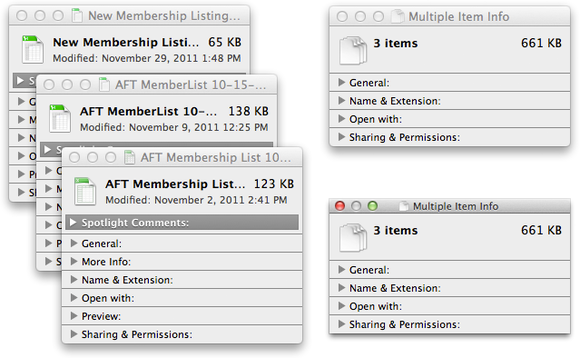 Select three documents and choose File > Get Info to see three individual Info windows (left). Press the Control key to reveal the Get Summary Info menu command that opens a single aggregate window (top right). The Option key reveals the Show Inspector menu command, which opens the Inspector window (bottom right), which changes in response to what you select in the Finder. If you have only a single item selected, there’s no difference between Get Info and Get Summary Info. But say you want to move several large files to a USB stick and you want to know if they’ll fit. There are other items in the folder, so checking the folder size won’t help. The Finder’s Inspector window is a hidden gem. Select an item, or multiple items. Hold Option to change the File menu’s Open command to Show Inspector. The window that appears when you select this seems, at first glance, to be a duplicate of the Info window. But a closer look reveals that it has a different title bar—thin and squared off instead of the standard height with rounded corners. And, sure enough, it behaves like a palette rather than a window, remaining on top of all other Finder windows. But that’s a minor convenience. Its real power is that it changes to reflect whatever selection you make in your Finder window. So, you don’t have to open and close individual Info windows to inspect file and folder information. Sure, you can copy and paste files and folders in the Finder with the Edit menu’s basic Copy and Paste commands (Command-C and Command-V, respectively) . But there’s another option—or should I say “Option”? Use the Option key to change the Finder’s Paste Item command to Move to Here. (Its keyboard shortcut, Command-Option-V, adds Option to the standard Paste shortcut.) This is much easier than dragging an item to a new location when the target window isn’t already open. For more details, check out this article I wrote about special uses for the Copy and Paste commands. Your current window shows your folder’s contents, but you want to move up to see what else is in its parent folder. So you select Go > Enclosing Folder (or press Command-Up Arrow). But if what you really want to do is to peruse the enclosing folder without losing the current window, press the Control key to change the command to Enclosing Folder in New Window (or press Command-Control-Up Arrow). You can change or close all your Finder windows in one fell swoop just by adding the Option key. For example, select the Window menu and then hold down Option. The Minimize and Zoom commands change to Minimize All and Zoom All. Use the same trick to change File > Close Window command to Close All. Bonus tip: Click on the red, yellow, or green button at the top of any Finder window while holding down Option to close, minimize, or zoom all open windows. Say someone has explained that you can fix a wonky program by deleting its preferences files. Here’s a quick way to get to those files in your Library folder without drilling down through many folders: Select the Go menu and then press Option to see Library appear in the list of options. On a big screen, you may have to drag a long way to move an icon into the Dock. Instead, select the icon, and press Shift to change the File menu’s ‘File > Add to Sidebar’ command to File > Add to Dock. When you’ve made one or more selections in a List view window that has no empty space at its bottom, it’s not easy to deselect everything. That is, not unless you use Option to change Edit > Select All (Command-A) to Edit > Deselect All (Command-Option-A). There are two basic organizational options for a Finder window: sorting, which puts things in order by name, size, kind, modified date, and so on, and arranging, which groups things according to certain aspects. You can use both options to, say, group things according to type—folders in one group, documents in another—and then sort items within those groups by something like creation date. The View menu provides only an Arrange By command, and you’re stuck sorting things by clicking on columns in List view windows—unless you press Option to change the command to Sort By. Bonus tip: If you’ve put the Arrange button in your Finder window’s toolbar, press Option to change its menu to sorting choices; the name of the button doesn’t change, but its options do.